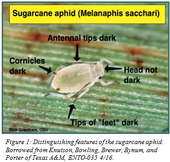 Last year many forage sorghum fields were heavily infested and damaged by Sugarcane Aphid (SCA) (Figure 1) – Melanaphis sacchari – feeding. Most calls came in around early July of 2016 with reports of aphids that were not well controlled using broad spectrum materials such as malathion, chlorpyrifos, or dimethoate. 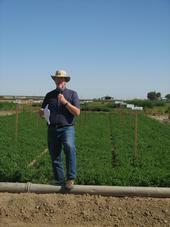 This triggered investigations which confirmed the invasion of the new species of aphid to California. Based on field research and extension material from the US states in the South and Southwest, some basic guidelines for spotting, scouting, and treating SCA can be outlined for potential best management practices in our CA forage sorghum production system.